According to the Getty Thesaurus of Geographic Names, there are 7,090 cities and towns in the world. The odds of any two cities becoming sister cities are pretty long. Pairing two cities in the world would seem to be a fairly random process and the chance of a successful union is by no means a certainty. Many sister city affiliations have failed and few have succeeded as spectacularly as the union of Medford, Oregon and Alba, Italy. What constitutes success and why do we have sister cities in the first place? The longevity of a sister city program and the number of people on both sides of the exchange who have been positively impacted by the exchange are good metrics of success. By this standard, the Medford-Alba connection is unequaled. The reason many of the original sister city affiliations were created was President Dwight Eisenhower’s “People to People” initiative that sought to address a growing perception that Americans were not good global citizens. Over the years, new sister city connections have been formed for a variety of reasons and motivations, some more worthy than others. From the outset the Medford-Alba program has always been about bringing people together. A mature sister city program like the Medford-Alba connection exists on many levels and in several dimensions. There is the official bond between the two cities but, after many years, the connection includes a complex tapestry of family and individual friendships. There is a rich history of interaction between the people of Alba and the people of Medford that has led to a greater appreciation of the culture and character of both cities. We not only enjoy genuine friendships but have gained an appreciation of why the citizens of our sister cities are who they are. Given the dramatic differences in the histories of the two cities, the language barrier and the cultural differences, it is remarkable that deep and abiding friendships are formed so readily. That the people of two such different cities would have such an affinity for each other is both remarkable and wondrous. The population of Alba is not as transitory as that of the typical American city. Families are fixtures of the community much more so than they are in Medford. The culture and character of Alba today is very much a product of Alba’s history, recent and ancient as well. The Albesi take great pride in their rich traditions and a history that predates the Roman city of Alba Pompeia. The very geometry of the city was determined two millennia ago. The historic center of Alba is a treasure of antiquities from every age of European history. Parts of the original Roman city have been excavated and preserved a level below the streets and piazzas where the vibrant life of the city goes on today. Before the railroad arrived in southern Oregon in 1883, Medford did not even exist. The orientation of the streets of downtown Medford was based upon the alignment of the railroad tracks. Alba’s history has been both glorious and fateful. The city has been visited by invaders and occupiers throughout centuries of its history. It has endured the hardships that afflicted all of Europe including plagues, wars and political upheaval. Alba has been under many flags but somehow its sense of place and purpose has endured and can be seen in the courageous and resourceful people who are the Albesi of today. Given the city’s history of oppression by outsiders, it is indeed remarkable that the people of Alba are as warm and welcoming as they are. There are citizens of Alba alive today who clearly remember how the city suffered under Nazi occupation and fascist oppression. Recollections of the heroic resistance are alive today and are forever immortalized by observances of Alba’s courageous partisans and its special status as the recipient of the Italian Republic’s Gold Medal of Military Valor. Alba’s own Beppe Fenoglio gave future generations a vivid picture of the resistance in his writings about living through Alba’s darkest days. The renaissance that took place after the war is a uniquely Albese story. Several great multi-national corporations grew from small family businesses that emerged from the war torn city. Ferrero, Miroglio and Mondo Rubber are industrial giants that demonstrate the entrepreneurial genius of the families of Alba and the resilience of the city. In Medford, there is great excitement surrounding the sports rivalry between its two public high schools, North Medford and South Medford. In Alba the competition is between the “borghi”, zones in the historic city that date to medieval times. 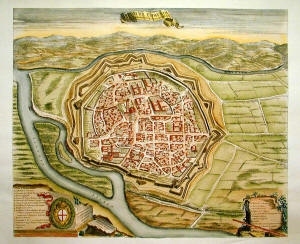 There are nine such districts in the city of Alba, each with its own unique history, colorful coat of arms and equally colorful name (Borgo of the Frogs, Borgo of Smoke, etc,) . The annual Paglio degli Asini, a donkey race, is the Alba equivalent of the “Black and Blue Bowl” in Medford. The race was first run in 1932 but its origins date to a feud with the city of Asti that began in 1275. There is a lot of pride riding on these uncooperative steeds who sometimes have to be pushed by a frustrated jockey. When Medford was paired with Alba in 1960, there were similarities in the two communities. Alba and Medford shared some essential traits. Both cities had nearly the same population and both were the centers of flourishing agricultural regions. Both cities enjoyed remarkably similar temperate climates due to their proximity to the sea. The two cities were similarly located in large river valleys surrounded by scenic foothills and the mountains beyond them. Their differences in language, culture and history were not barriers but gifts that they would come to share and appreciate. That the people from two such different places and cultures can enjoy an instant affinity is a wonderful thing to be treasured, celebrated and passed on to future generations.